Misdirected eyelids or eyelashes can cause mild eye discomfort or more severe eye problems. Your eye requires a good, functioning eyelid to stay healthy. Misdirected eyelashes or eyelids can cause corneal abrasions, constant irritation, severe dryness, and even scarring. If your eyelid is not working properly, your eye health and vision can be threatened. These three conditions can come with age, trauma, scarring, or other nerve conditions. In the situation where an eyelash is touching or poking your eye, “plucking the eyelash” is usually only a temporary fix. If your eyelashes scratch your eye or you have a constant “foreign object” feeling within the eye, please contact our clinic for a complete eye exam with one of our doctors. Your doctor can counsel you on the best treatment. 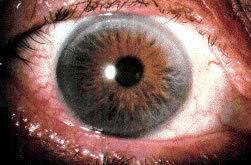 Mild conditions may only require lubricants such as eye drops or ointment (see Dry Eyes). More severe entropion/ectropion misdirections require lid surgery called blepharoplasty. Blepharoplasty is used to alter eyelid alignment in order to fix the lid problem (see Lid Lifts). Trichiasis requires electrolysis to remove and to kill the problematic hair follicle. Gene Johnson, M.D., our eyelid specialist, treats trichiasis, entropion, and ectropion as outpatient conditions.